SIGN UP: READ THIS BLOG POST! – I know it’s long but PLEASE READ IT!, Fill out the Questionnaire at the bottom if you haven’t previously (you only fill it out once)! – then email pabkins at gmail dot com with “PEOPLE WITH PETS” and your instagram ID in the subject line! People WITH their pets? Yes! That means your card must contain a character WITH their pet or pets. They can be fantasy or science fiction (that pretty much encompasses anything that doesn’t exist in reality!) Does that mean you can’t draw a real animal? 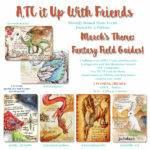 Not necessarily there are always ways to put a fantasy spin on your card if you want to draw a real animal – I’ll leave that up to your creativity, but you really should be thinking in the area of fantasy and science fiction. So if you are determined to draw a cat then why not give it a horn or two tails, etc. I’ve created a pinterest board again to help inspire folks or give them ideas for realistic animals but still in a fantasy/sci-fi setting. I had a harder time finding sci-fi examples sorry. Please think about background, accent, composition, Be creative and make some gorgeous cards! Many folks participate monthly. You want your cards to be unique so that if someone receives another of your cards that don’t feel like they are getting the same thing each month! CANADIAN ARTISTS – Your envelop SHOULD BE MAILED AND POSTMARKED on or before July 20th. Mail from Canada to US usually takes 4-10 days. Stickers or prints 5×7 or SMALLER! It is up to my discretion to return cards unswapped! Examples of when this might happen are if they: 1) arrive too late to go into the swap (or you’ve consistently been late each month) 2) Do not fit the theme! 3) show lack of honest effort or there are no comparable effort cards to swap them with, 4) they do not meet the theme or size requirement, rough edges, poorly cut or 5) are damaged. Please do not make me the bad guy!